Dav Ardlie nervously walked into the Bourke and Sons funeral parlour in Dublin with an unusual request - but perhaps not as unusual as it sounded! 'Excuse me. I was wondering if you could help me. I'm looking for a second-hand horse.' Of course, he meant 'hearse' and it was from this inauspicious start that three Aussie lads, living in Ireland, came up with the idea to turn the backpacker's overseas odyssey into 'something rather different'. A black Ford Granada - affectionately christened the Big Girl and universally recognisable as a hearse - was chosen for its undeniable suitability as a touring vehicle. By test-driving it through the streets of Cork, and inadvertently gate-crashing a funeral procession, Dav, Wegs and Whitey also discover its innate ability to attract an audience - for better or for worse. From partying and hangovers, where they cross paths with the legendary 'Van Tour' at the must-see European tourist destinations, to being thrown into a Macedonian gaol under suspicion of spying, and experiencing the unexpected warmth and friendship of fellow travellers and strangers, life on tour with the Big Girl is never dull. In fact, life without the Big Girl is impossible to contemplate, and despite bureaucratic negotiations of monumental proportions over several continents, Dav and Co. manage to achieve their goal and bring the Big Girl home to Australia. 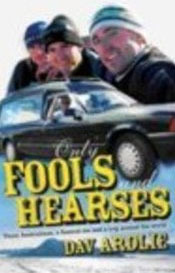 Only Fools and Hearses is heart-warmingly familiar to multitudes of travellers who have backpacked overseas. It's a warts and all humorous account of three loveable lads - and a hearse - travelling the world.